The object of Prevision Three Pictures is to beat the Banker with the highest combination value of 3 cards. A hand consisting of three face cards (J, Q or K in any combination) is the highest ranking hand, followed by the ranking sequence. This is a simple game where the Player and Banker each draw 3 cards and the one having the highest ranking set of cards wins (suits are excluded). For a detailed listing of the card rankings, please refer to the chart below. 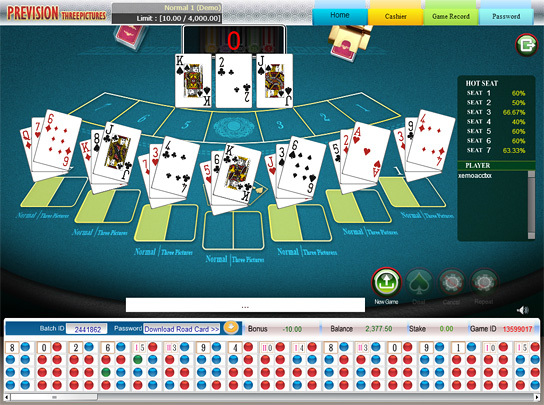 The Player is allowed to place bets on every seat at the table. The Players and the Banker will each receive three cards. Each player's cards shall then be compared with the Banker's cards and the highest ranking set of cards wins. The highest ranking hand is known as "3 Knights", this is a hand with 3 picture cards and others will count as the face value of the 3 cards with the highest score being 9. All picture cards (K, Q and J) and Tens shall carry the value of "0"; other cards shall carry their denoted numerical value. Aces shall carry the value of one. In the event that the total exceeds 10 points, you eliminate the 10-column. Example: If the player has 10+4+8, it counts as two points. With a Normal bet, the Player or Banker must have a winner, the winner is determined by whoever has the highest ranking set of cards. If the Player wins the game with total points of 6, regardless whether it is 'Double knights Six', 'Single knights Six' or 'Plain Six', the Player will get half of the payout. If the outcome is a Tie, then all bets on 'Normal bet' will be void. In order to win Three Pictures Bet, the cards must consist of a combination of any 3 picture cards. If the Player's cards are ranked as 3 pictures, no matter what the Banker's cards are, the Player will win the 'Three Pictures' bet. In the event of the total point count and the card ranking being the same, the game is a TIE. However, if both sides have the same total point count but one side has at least a Knight, then it will not be considered a Tie. Outcome = Banker wins as Single Knight Zero is ranked higher then Plain Zero.